GENERATION RIGHT is a 40 minute long documentary funded by Sheffield University as part of its research into changing generational social attitudes. 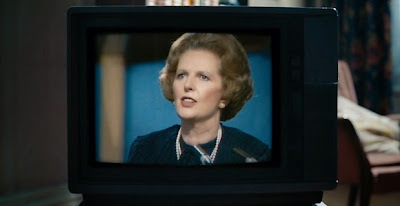 In this case, the film examines the radical nature of Margaret Thatcher’s premiership and its impact on pulling the centre ground to the right. It argues that her legacy was to redefine the boundaries between state and citizen, so that where her privatisation programme was seen as radical, Tony Blair could then only be elected by moving Labour to the right, and continuing her legacy with regard to parts of the National Health Service and student loans, as just some examples. One could read this message onto the latest UK General Election results which resulted in a higher proportion of voters voting for right wing parties that at any times since 1900. In other words, far from dying, Thatcher’s legacy lives on with an arguably bigger mandate in David Cameron’s majority government. I have a lot of sympathy with the thesis of this film, but there are three problems with it. The first is that its central thesis is hardly original. And for anyone with any familiarity with the period, there is nothing new in this documentary. We get all the familiar iconic speeches from Thatcher - the lady’s not for turning, there is no such thing as political crime - and her presence dominates the film. The second, and more serious, problem with the film is its lack of balance. Now here I am willing to give the director the benefit of the doubt. I have no trouble believing that her intention WAS to make a balanced documentary and she almost succeeds, which says a lot given the highly divisive impact Thatcher still has in this country. The problem is the imbalance of the people the director interviews and the way in which she uses archive footage. She gets access to Douglas Hurd and Michael Howard and Norman Tebbitt and all three eloquently rehearse their, and Thatcher’s beliefs. Clips of ministers from Nigel Lawson to Boris Johnson seem to strike a political line from the 1980s to the 2010s showing those of the powerful elite to be Tories. By contrast, those who oppose the rightward drift are typically the ordinary people. Aside from David Blanket, we don’t get contemporary left-wing leaders interpreting the events of the 80s to balance Tebbitt, Howard and Hurd. And where we DO get left-wing activists speaking eloquently about the social cost of Thatcherite policy, we don’t ever hear from a “normal” person who supported her, and still does. The result is a feeling that the 1% has moved the country rightward illegitimately and in the teeth of the people, belying the election results. The final problem with the film is that it never addresses why Thatcher succeeded. If it is right and she DID fundamentally change the country, how was this possible? Judging by the material in this film ALONE one would have to say it was her powerful rhetoric combined with a brutal police crackdown on the Unions. But what of the culpability of the Left? The film argues persuasively that crime and drugs filled the vacuum left by unemployment. Well didn’t Thatcher fill the void left by the disintegration of the Left? Where is the mention of the split between Labour and the SDP? It seems to me like this is a point that could have been well made and left to resonate with audiences seeing Cameron win the last election because the populist vote was similarly fractured. All of which makes it sound like I didn’t enjoy GENERATION RIGHT. That’s not at all the case. As an admitted Thatcherite who benefited greatly from her policies, it is always a pleasure to sit back and listen to an hour of powerful oratory. But even I would say that my choosing to omit any countervailing oratory from Michael Foot and Neil Kinnock, this film let’s her dominate, perhaps unthinkingly. So, this film is a pleasure, but probably not in the way intended by the film-maker. GENERATION RIGHT has a running time of 41 minutes.